Share information about the soil in your area with other users and help us to improve our soil map of the UK. Let's put citizen science into action and build up a community soils dataset produced by you - the users. All information submitted is anonymous and will be published within this application under the Open Government License. Land cover map is widely used for decision making in the UK, it is compiled from satellite data but needs ground truth. Please help to validate the CEH Land Cover Map 2007 in order to improve the accuracy of this dataset. Using the imagery backdrops in UKSO or your local knowledge, tell us whether or not we have correctly identified the land cover type. If you are at the location, please send us a photograph. The Land Cover Map 2007 layer has been added to the map (if it wasn't already there) and the 'Imagery' basemap has been selected, you can use other basemaps e.g. street map to find your town. Zoom in to an area you wish to validate. You can also enter a placename or postcode on the location textbox at the top-left of the screen. Remember to open up the legend on the upper tool bar. Click anywhere on the map to get the land cover value for that location or check the layer's legend. Press, 'is this Land Cover Type correct?' to bring up data entry window, move to the side and keep open. Change the transparency using the slider to compare layer against aerial photography background. Please confirm if the land cover is correct or incorrect. If you think the land cover type is incorrect, let us know what you think it is. For multiple submissions, keep the validation form open, moving it to one side, and click on a new map location after every submission. Testing the pH of your soil is fairly easy to do. It does require a simple kit that you can buy from hardware stores or garden centres. Each kit will come with its own instructions that will guide you through the process of sampling and testing. Your testing kit will tell you a pH on a scale from 1 (very strongly acidic) to 14 (very strongly alkaline). Most soils fall in the pH range 3 to 9. Choose the closest value from our pH ranges that matches the value shown by your kit. Don't worry if the wording doesn't match exactly, use the pH value to find the closest match, i.e. if your kit identifies your soil as pH 7, then choose the Neutral (6.5 – 7.2) category. Traditionally, soil scientists use several field and laboratory-based techniques to identify soil texture including sieving, sedimentation and laser granulometry. There are international standards for describing soil textures in terms of their clay, silt and sand content. 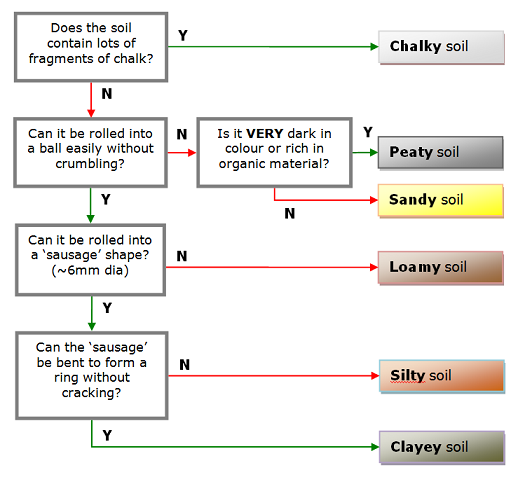 However, for mySoil, we have some simple tips to help you identify your soil from the six classes we use in the app. Chalky soil can be clayey or sandy, but is notable for the many fragments chalk or limestone that it contains. If testing for pH, chalky soils tend to be alkaline with moderately high pH (8+). Sandy soil feels gritty to touch, It will not hold its shape when squeezed into a ball because it crumbles easily, so it is easy to dig and work. It drains very well and can dry out quickly. Loamy soil is often the preferred soil type. It is made up of a roughly equally mixture of clay, silt and sand. Loamy soils hold together when squeezed into a ball. they do not feel sticky or gritty. They are easily dug, retain moisture and are nutrient rich. Silty soil feels smooth to the touch, but not sticky and can be rolled or molded into a thin sausage-shape easily. Clay soil feels smooth AND sticky to the touch. It can be molded into any shape and leaves smears of clay when rubbed between your fingers. Very heavy to dig and work, clayey soils can dry out in hot weather and form deep cracks. Peaty soil contains a lot of organic matter and is very dark in colour. It feels spongy when squeezed but crunbles apart. It can absorb a lot of water but dry out quite quickly. If you have a pH testing kit it will have a low pH (i.e. Acidic). The following chart describes how you can estimate your soil-type by trying to mold a small sample of it into different shapes. Generage a PDF of the map including title and legend. Note that it will always export a 2D version of the map, even in 3D mode. Create a screen capture of the map without the UI elements and save it as PNG.